Remove the front bumper fascia. Refer to EXT-17, "Removal and Installation". Remove the front combination lamp bolts (A). Pull the front combination lamp (1) forward. Disconnect the harness connectors from the front combination lamp (1). After installation, perform headlamp aiming adjustment. Refer to EXL-115, "Aiming Adjustment". Do not touch bulb by hand while it is lit or right after being turned off. Burning may result. Remove the core support cover. Refer to EXT-23, "Exploded View". Rotate the plastic cover counterclockwise and remove. Rotate the headlamp high beam lamp counterclockwise and remove. Disconnect the harness connector from the headlamp high beam lamp. After installing, be sure to install the cover securely to ensure watertightness. 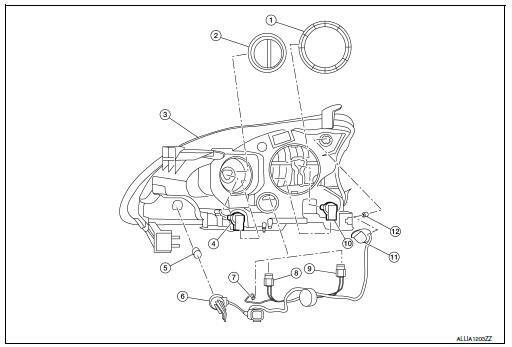 Rotate the headlamp low beam sockets counterclockwise and remove. Disconnect the harness connector from the headlamp low beam lamp. Rotate the side marker lamp bulb socket counterclockwise and remove. Rotate the turn signal lamp bulb socket counterclockwise and remove. The park lamp LED bulb is integrated into the front combination lamp and is serviced as an assembly. Refer to EXL-119, "Removal and Installation".